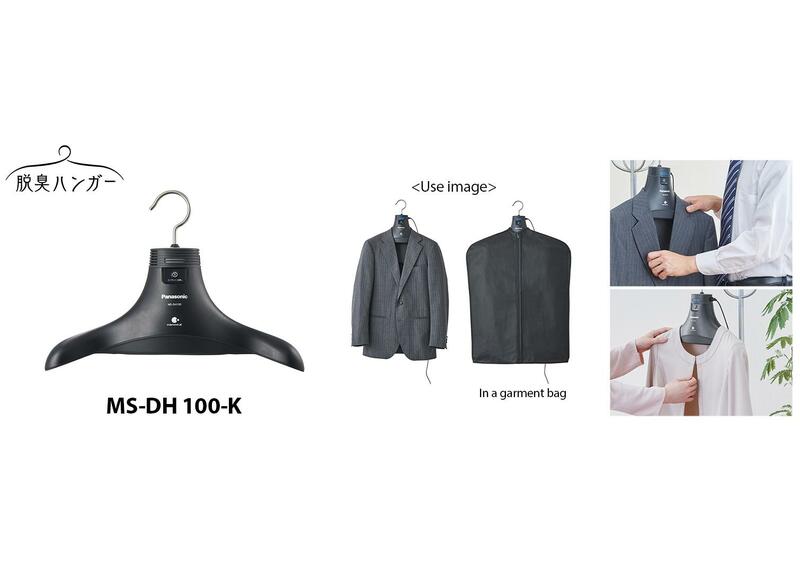 MS-DH100, Pollen inhibiting (*1), deodorizing (*2) hanger equipped with "nanoeTM X"
Osaka, Japan - Panasonic Corporation will begin selling the deodorizing hanger, MS-DH100, equipped with "nanoeTM X," which generates 10 times (*3) more hydroxyl (OH) radicals than the "nanoe" and thereby inhibits odor and pollen, on September 1, 2017 (in Japan only). In recent years, awareness about cleanliness has increased and approximately 80% of the population in Japan are either using deodorizing sprays or are having their clothes dry cleaned. 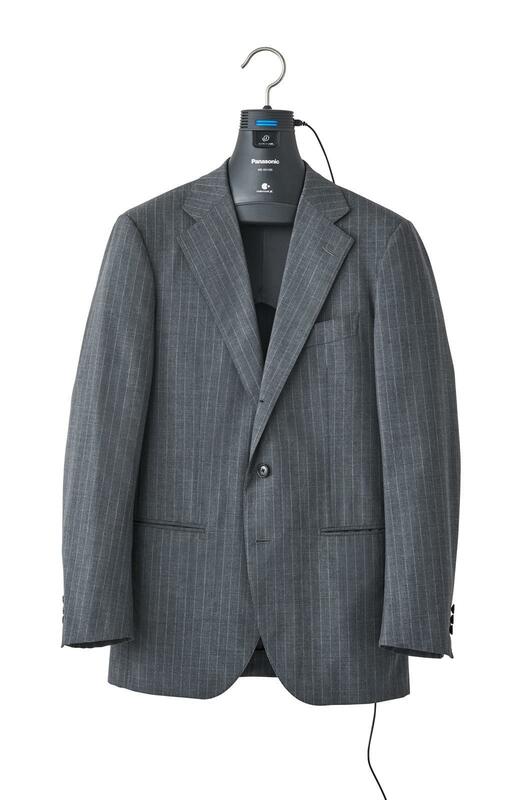 And with respect to the types of clothes people are most concerned about when it comes to smell, clothes that that easily absorb odors on both the inside and outside and are difficult to wash such as suits (jackets), jackets, and coats are ranked No.1, 2, and 3 respectively (according to Panasonic research (*4)). 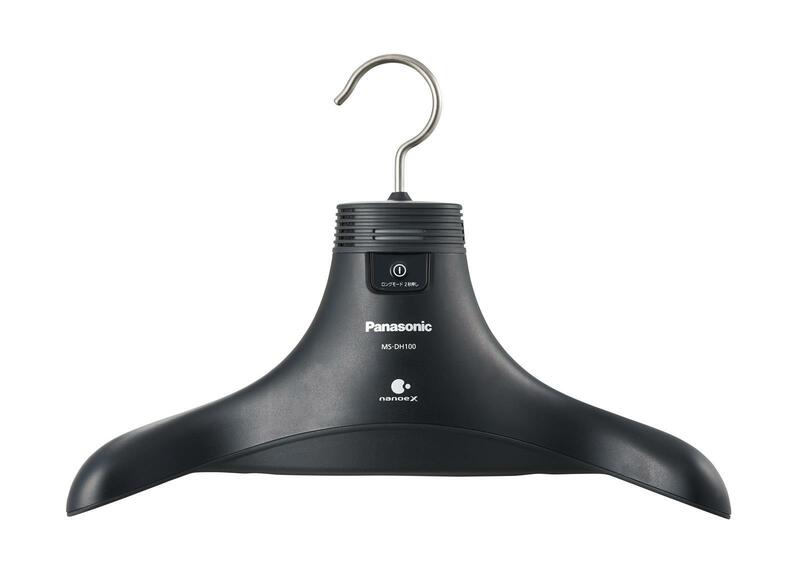 This new hanger is equipped with Panasonic's proprietary nano-sized electrostatic atomized water particle device, "nanoe X." 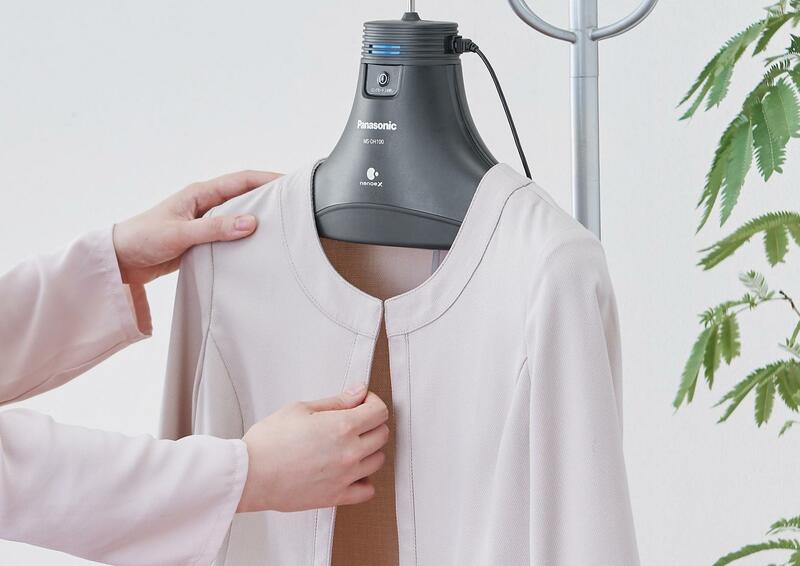 When it is turned on, the hanger generates "nanoe X" particles, which dissolve and eliminate odor (cigarette smoke, sweat, BBQ, etc.) These particles also inhibit pollen (*1). 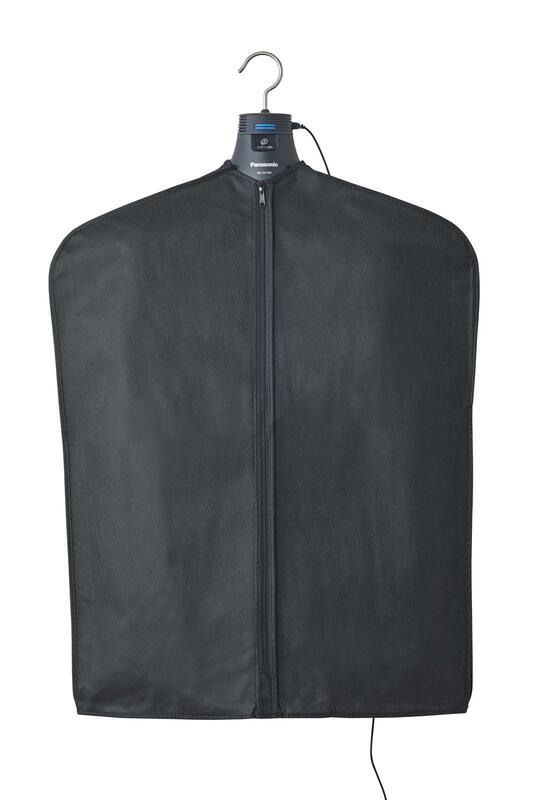 When used together with the garment bag supplied with the hanger, the "nanoe X" particles reach deep inside the textile working on both the inside and outside of the garment. All you have to do is place your clothes on the hanger. Moreover, 8 vents facilitate dispersion and enable "nanoe X" particles to reach every inch of the garment. The hanger also has a thick, 3D shape, helping to retain the original shape of the garment. 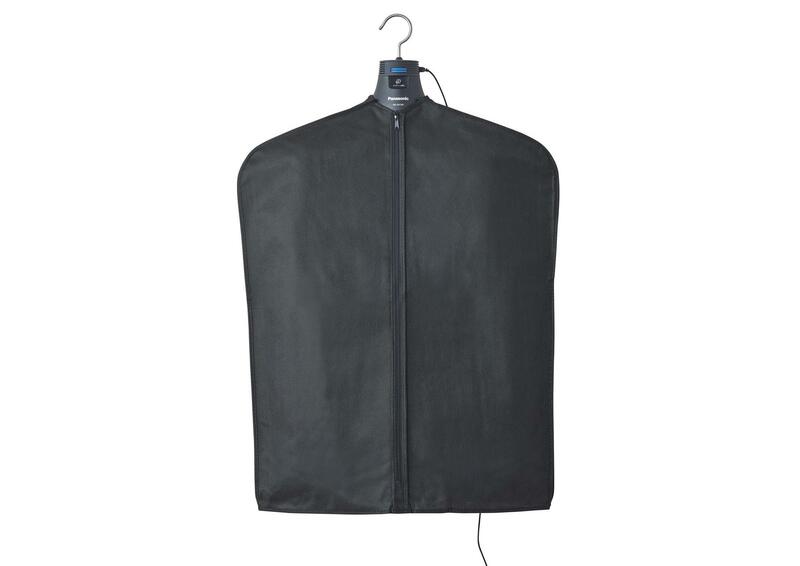 The hanger comes with 2 modes, the normal mode (runs for approximately 5 hours) and the long mode (runs for approximately 7 hours) for those days when you are especially concerned about smell or pollen. What is more, both modes cost less than 1 yen per use (*5), so it is very economical. It can also run on a mobile battery (*6), so the hanger can be used without plugging it into a power source. 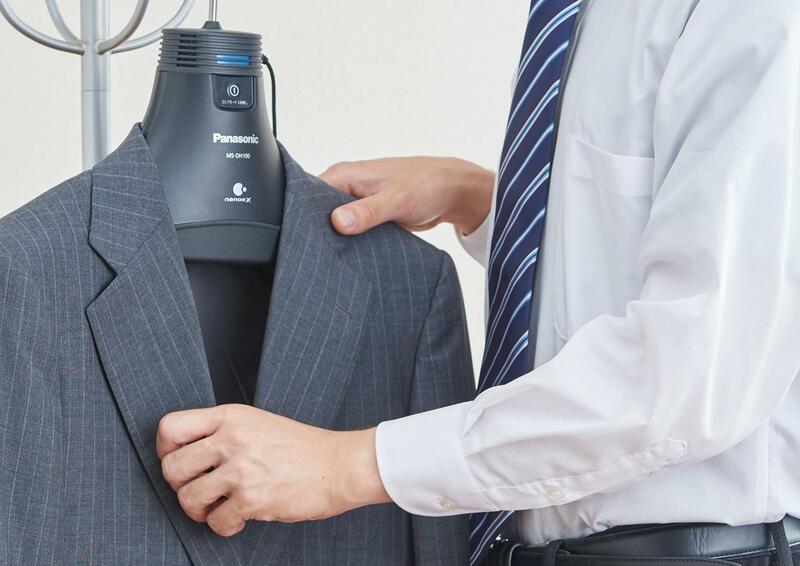 With this product, Panasonic is proposing a simple way to care for clothes and creating new demand. 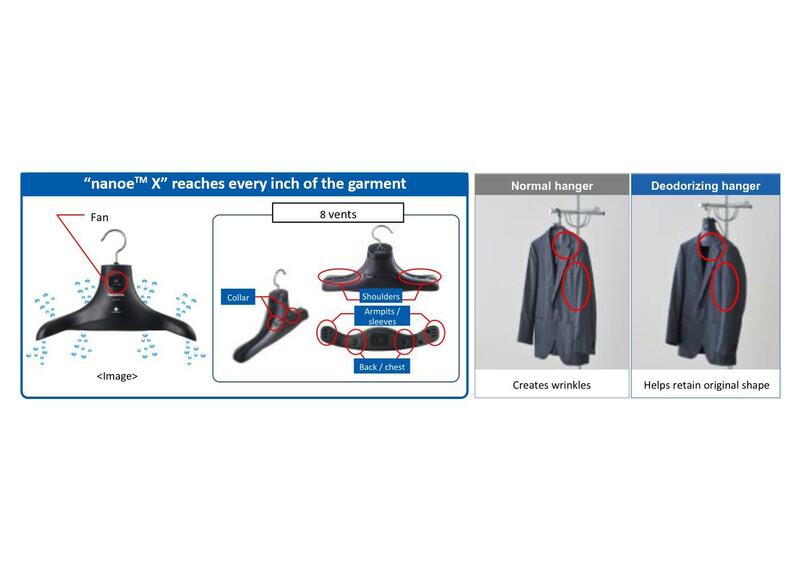 The "nanoe X" equipped hanger can dissolve and eliminate smells (*2) and inhibit pollen (*1) on clothes. The hanger is equipped with Panasonic's proprietary nano-sized electrostatic atomized water particle device, "nanoe X." The "nanoe X" particles range from approximately 5 to 20nm and can permeate deep into the textile to dissolve and eliminate odors such as sweat, cigarette, and BBQ (*2). Moreover, by transforming the proteins found in allergens, it can also inhibit pollen (*1). It is simple and easy to use. All you have to do is place your clothes on the hanger. 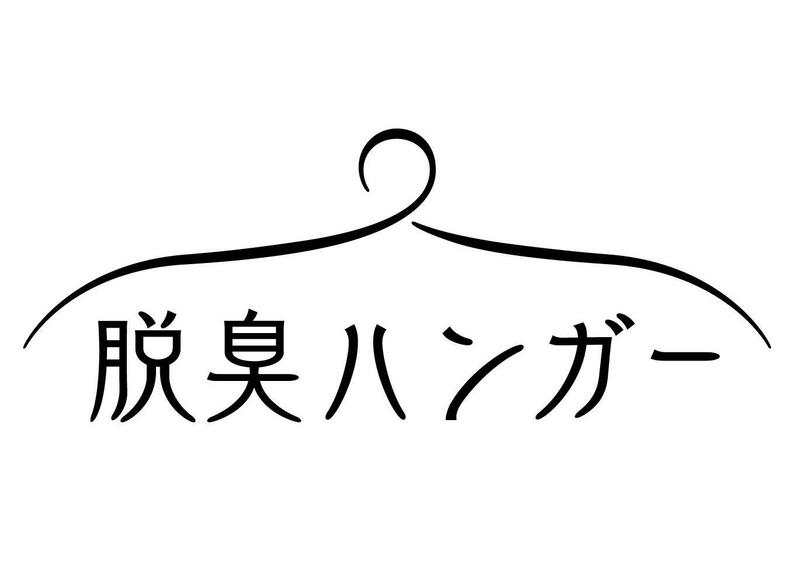 The hanger is shaped in a way that facilitates the dispersion of "nanoe X" particles and the 3D shape retains the original shape of garments. The 8 vents facilitate dispersion of "nanoe X" particles and enable the particles to reach every inch of the garment. 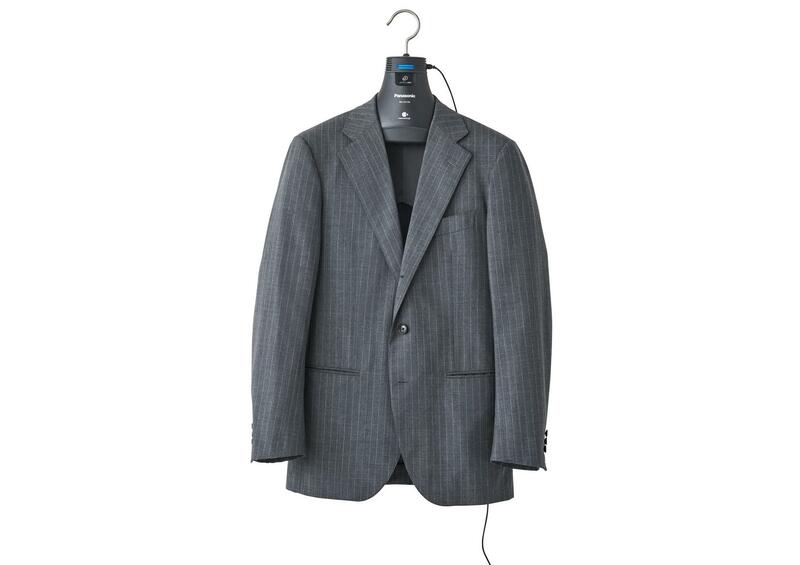 The hanger also has a thick, 3D shape, helping to retain the original shape of the garment. It costs less than 1 yen per use (*5) so it is economical and can run on a mobile battery (*6). The hanger comes with 2 modes, the normal mode (runs for approximately 5 hours) and the long mode (runs for approximately 7 hours) for those days when you are especially concerned about smell or pollen. All you have to do is place your garment on the hanger, and the hanger will take care of the rest while you are fast asleep. Both modes cost less than 1 yen per use (*5), so the hanger is very economical. It can also run on a mobile battery (*6), so the hanger can be used without plugging it into a power source. - These results were not obtained under actual use conditions. *2: Effect on deodorizing sweat (acetic acid) and cigarette smoke. Tested at the Panasonic Corporation, Product Analysis Center. Testing method: 6 stage odor intensity measurement method in a 23.4m2 room. Deodorizing method: Generate "nanoe." Results: (Sweat) odor intensity decreased by 2.3 in 5 hours; (cigarette smoke) odor intensity decreased by 1.1 in 5 hours (garment bag used). Effect on deodorizing BBQ smell. Tested at the Panasonic Corporation, Product Analysis Center. Testing method: 6 stage odor intensity measurement method in a 9.72m2 room. Deodorizing method: Generate "nanoe." Results: (BBQ) odor intensity decreased by 0.9 in 5 hours (garment bag used). - The effectiveness of deodorization will differ depending on the odor as well as the type of textile. - Sensitivity to the effectiveness may vary from individual to individual. *3: Panasonic research - measured based on the ESR method. Comparison of 480 billion "nanoe" particles per second and 4.8 trillion "nanoe X" particles per second. 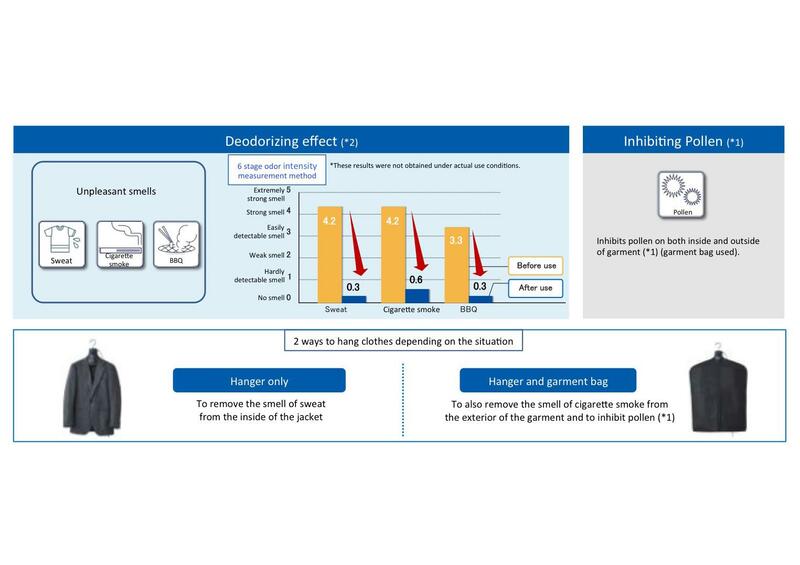 *4: Panasonic research - On odor care for clothing (N=600). *5: Calculated based on new electricity rates - 1kWh = 27yen (including tax). *6: Panasonic tested the QE-AL201 (built-in battery capacity 5,000mAh, rated output DC 5 V, 1.8A) and the QE-AL301 (built-in battery capacity 7,500 mAh, rated output DC 5 V, 1.8A). The QE-AL201 was able to run the normal mode approximately 1 time. The QE-AL301 was able to run the long mode approximately 1 time. The length of operation may differ depending on the conditions/environment under which the mobile batteries are used, and other factors, and this does not provide any performance guarantee.